This is a very simple soup that’s perfectly lovely on its own, without the gremolata. I added that for a bit more festivity and some crunchy contrast. It is, after all, Thanksgiving – why not go with a little extra flourish? Heat the olive oil and butter in a large stockpot over medium-high heat. Add the leeks and cook, stirring occasionally, for 5-7 minutes or until very soft. Add the sweet potato, thyme, salt, and pepper. Stir to thoroughly combine the ingredients, then pour in the apple cider and chicken stock. Bring to a boil, then reduce to a simmer and cook for about 20 minutes, until the sweet potatoes are tender but not falling apart. While the soup is cooking, make the gremolata: In a small skillet over medium heat, combine the sage leaves and olive oil. Cook until the sage leaves are crispy but not brown, about 5 minutes. Remove the leaves from the oil with a slotted spoon (I saved the sage-infused oil and used it to rub a roast chicken when I tested this recipe – you could certainly add the sage oil to your turkey if you don’t want to waste it!). Combine the pumpkin seeds, crisp sage leaves, and orange zest in a mound on a cutting board. Chop them all roughly together, until the mixture is about the texture of coarse breadcrumbs. Before serving, remove the stems of the thyme sprigs from the soup (the leaves will have fallen off) and use an immersion blender to roughly puree the soup. You don’t want it smooth, but rather partly smooth and partly chunky. 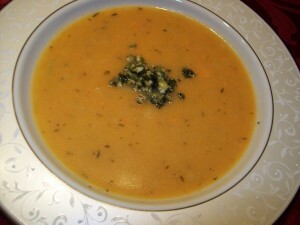 (Blending also gives a nice vibrancy of color to the broth, while leaving lots of sweet potatoes and leeks recognizable.) Pour into bowls and top each with a spoonful of the gremolata.